Fresh out of college and ready to give back to my community, I took a job in the largest elementary school in the largest inner city school district in San Antonio, Texas. The location of the school was close to the neighborhood where I grew up, and the need to help at-risk students was certainly still there. I wanted to make a difference in the lives of young people, in the way my teachers had helped me. It wasn’t long before I realized how much I still needed to learn about teaching. To this day, I carry with me the name and memory of one little boy who left my fifth grade classroom unable to read, only to enter middle school completely unprepared. I have carried the look of his eyes with me ever since. I know I didn’t teach him what I could have now, nor was I remotely capable of providing him with the skills he needed. I often fear he dropped out of school and became one of many in a slew of terrible statistics. Regretfully, I have to own this real possibility. After that experience, I was desperate to work hard, make things right and find a better way, but I had no clue about where to begin. I had been taught many strategies and had been trained in various programs. Yet, none of it was effective for struggling students or truly aligned grade to grade, language to language, or class to class within a grade level. Worse still, there was no continuity between the content areas or among grade levels. Reading was a 90-minute class. Writing was often another block of time on a schedule. None of it allowed depth of understanding over time to show measurable growth, especially on standardized tests. I approached my supportive principal about looping a class from 3rd through 5th grade, and she approved it with one condition: I had to agree to take any student she wanted to place in my class at any time, no matter the circumstance. It made total sense. If I was going to make a difference, it should be with students who needed the most help. I excitedly agreed. If I couldn’t find a program, I would ensure the consistency myself. It was in those years, I met Lois Fisher when she presented a workshop in my school, much like the way I meet many teachers today. Her workshop was not a program. It taught us how to teach more effectively with any program or curriculum; it changed my teaching forever. Her workshop was followed by co-teaching lessons in my classroom. She walked through my classroom door and taught me to be a better teacher. This was over twenty years ago before co-teaching was the highly respected practice of modern classrooms today. My students had the most successful years after working with Lois. In fact, I was so successful, I was asked to step out of the classroom and become the Instructional Guide for the campus. Within one year of implementing some of Lois’ strategies school- wide, our school reached a “Recognized” status for the first time as measured by the state test. For a school that size, with numerous obstacles, it was a real and measurable accomplishment! Those experiences remain the most rewarding part of my teaching career. If I had known then, what I know now, I could have helped my sweet 5th grader all those years ago– he remains the seed of motivation for my work today. I believed so strongly in the way Lois connected and organized concepts that I inquired about learning more. I reached out, and she helped me understand at greater depth each of the concepts I tackled in reading, writing and math. Analyzing and teaching concepts that allow students manageable ways to successfully demonstrate knowledge and skills was and remains the constant challenge. Therein lies the art of teaching. Although Lois had organized her material, she had not yet written her first books. I happened to be at the right place at the right time. I volunteered to work with her. She took notice of my interest, and we began our working and life-altering relationship. She is my greatest teacher and a personal friend I love dearly. In 2000 she published her first books, Solutions for Success: Reading and Solutions for Success: Writing. The entire focus of these books is to assist teachers to improve reading and writing instruction for all students. In her words, “It is not enough to know a student’s strengths and weaknesses without knowing what they have to know and be able to do to be successful readers and writers. Some students can make a leap from one step to another in learning, but struggling students may need to learn each of the smallest steps in the task. They may need mental file folders to help them organize the context being read.” This is what we continue to provide for teachers as they decide what and how to teach. Then…after all of that…Lois decided to retire! She packed her materials up and stopped publishing her books. But in 2009 with what Lois calls my “encouragement” (but I call pushing), we took our work to the next level and developed animated e-lessons for reading comprehension and made them available on the Internet. 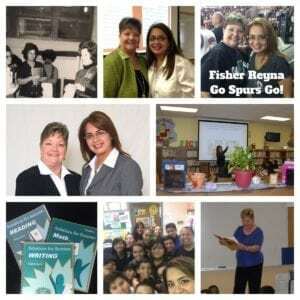 It was at that time we actually combined efforts and formed Fisher Reyna Education. This brief history is the truth in my teaching career thus far. Through this we evolved from consultants to practitioners, from teachers to educators in professional development. In 2015 when she told me she was moving to Oklahoma, my heart literally hurt. I knew our day-to-day working relationship was ending, and I had to continue to share her teachings alone. Although she still lends her valuable wisdom and expertise in many areas, she is no longer involved in the day to day work of schools, workshops, or teaching. So, I’ve made it my goal to improve our website and share the wealth of knowledge. Now, as Fisher Reyna Education, it is my sincere wish to bring you a global understanding of the scope of our work though our website and blog. In this way, you still get Lois…and I still get to keep her from retiring! It’s my intention to extend our successful approach as an option for teachers and students in the way that Lois Fisher shared her knowledge all those years ago in my classroom. It is our goal to enter through your classroom door and share with you valuable lessons in Reading, Writing, and Math. Click below to see a brief history in pictures.